Then he said, " A man had two sons, and the younger son said to his father, 'Father give me the share of your estate that should come to me.' So the father divided the property between them. After a few days, the younger son collected all his belongings and set off to a distant country where he squandered his inheritance on a life of dissipation. When he had freely spent everything, a severe famine struck that country, and he found himself in dire need. So he hired himself out to one of the local citizens who sent him to his farm to tend the swine. And he longed to eat his fill of the pods on which the swine fed, but nobody gave him any. Coming to his senses he thought, 'How many of my father's hired workers have more than enough food to eat, but here am I, dying from hunger. I shall get up and go to my father and I shall say to him, "Father, I have sinned against heaven and against you. I no longer deserve to be called your son, treat me as you would treat one of your hired workers."' So he got up and went back to his father. While he was still a long way off, his father caught sight of him, and was filled with compassion. He ran to his son, embraced him and kissed him. His son said to him, 'Father, I have sinned against heaven and against you; I no longer deserve to be called your son.' But his father ordered his servants, 'Quickly bring the finest robe and put it on him; put a ring on his finger and sandals on his feet. Take the fattened calf and slaughter it. Then let us celebrate with a feast, because this son of mine was dead, and has come to life again; he was lost, and has been found.' Then the celebration began. Now the older son had been out in the field and, on his way back, as he neared the house, he heard the sound of music and dancing. He called one of the servants and asked what this might mean. The servant said to him, 'Your brother has returned and your father has slaughtered the fattened calf because he has him back safe and sound.' He became angry, and when he refused to enter the house, his father came out and pleaded with him. He said to his father in reply, 'Look all these years I served you and not once did I disobey your orders; yet you never gave me even a young goat to feast on with my friends. But when your son returns, who swallowed up your property with prostitutes, for him you slaughter the fattened calf.' He said to him, 'My son, you are here with me always; everything I have is yours. But not we must celebrate and rejoice, because your brother was dead and has come to life again; he was lost and has been found.'" I would like to thank Fr. Pat for affording me this opportunity to return to St. Mark to preach at all the Masses. I would also like to thank Fr. Maher for giving me his pulpit time today. Many of you don't know this, but Far. Maher was my spiritual director before I entered the seminary and so I am grateful to him for his guidance and mentoring all these years. We're all familiar with the terms "cut your loses" and "opportunity cost." Whenever we deal with investments and we have an investment that isn't working out, we often have to decide whether or not we can absorb any more loses and if we can't, we cut our loses. We do this because we know that there's also an opportunity cost of not having our money with winning investments. In our Gospel today, we're presented with a parable that offers us two images of how God sees us and how broad and deep His mercy really is. 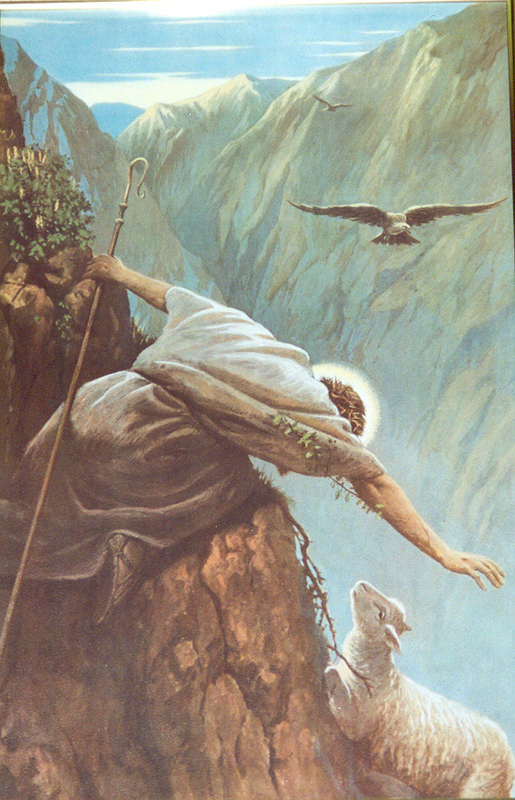 For our consideration today, I'd like for us to consider the first one: the example of the shepherd who leaves the 99 sheep to go after the 1 missing sheep. It seems to me that conventional, worldly wisdom would tell me that it would be foolish to go after one sheep and leave the other 99 abandoned and open to attack from wolves and other dangers. Worldly wisdom would tell me to cut my loses and not risk losing more sheep by looking for the missing one. After all, loses are bound to happen in the competitive world of shepherding and I should just accept the loss as part of the business risk. This worldly wisdom stands in almost complete opposition to divine wisdom. In the eyes of our Lord, he is the Good Shepherd, because He's not just dealing with goods or capital - He's dealing with us - the very persons He died to redeem. In the divine wisdom of the Good Shepherd, EVERYONE COUNTS. The Good Shepherd is pleased with the sheep that stay in the fold, but He never hesitates to go after the lost sheep because losing one is losing one too many. That is why frequent Confession is so necessary for each of us. In fact, Mother Theresa used to say that the greatest miracles occurring in the world outside of the miracle of the Mass, are not physical healings, but the miracles of hearts that are repenting and converting back to the Lord. God rejoices at the return of a wayward child and we should rejoice whenever we come out of the confessional, now reconciled to God and the mystical body of Christ, the Church. For God, EVERYONE COUNTS - from the unborn to the aged and everyone in between - we venerate the dignity of human life because Christ died for the human race. Because EVERYONE COUNTS, we're taking time today and this weekend to remember and honor those who died in the tragic events three years ago. The notion that EVERYONE COUNTS is the theme of what I'd like to spend the rest of my time preaching to you today. As you know, I transferred to Colonial Beach at the head of the Northern Neck to work with the Hispanic community. It's about an hour and 45 minutes away, in a rural, river setting. • Mass attendance has quadrupled. • I have been able to start English as a Second Language Classes; religious education classes; a nursery for young children while their parents take English classes; a GED program; and I've worked to better integrate the Hispanics into the mainstream community - for example, their participation in the annual parish bazaar for the first time in parish history. • Due to the fact that I am the first Spanish-speaking priest at the parish in nearly a dozen years, I've been able to make lots of in-roads in the community. This past Spring, I decided that it was time that the parish try to make a more concerted effort to help not only the Hispanics, but the general town and county population. With the support of my pastor and dozens of volunteers, I was able to take over an abandoned house on our property in order to begin converting it into what is now called Casa de la Caridad, or House of Charity. The upper part of the house will be used as a food bank and the lower part of the house, will become the Guadalupe Free Clinic. We are in the final stages of diocesan approval for the project. You see, when it comes to affluence, Colonial Beach is not Vienna or Oakton. My weekly collection from my Spanish Mass is less than $40. Nearly twenty-five percent of the residents in the town live at or below the Federal poverty line and easily 33 percent of persons there are medically uninsured. There is no free clinic between Fredericksburg 40 miles north of us and Kilmarnock, 55 miles south of us and none of the persons who live our town or county qualify for care from these free clinics because they are not in their service range. So, there are plenty of people who fall between the cracks. Most of my Hispanics do not work full time (partly because many are illegal aliens) and so do not qualify for free health care. There are hundreds and perhaps thousands of migrant workers who make the minimum wage and live in boarding houses and barracks and send $.70 on the dollar back to Mexico. So, the idea of the free clinic was born. Support from the community, in terms of volunteers, has been overwhelming. Just last month, 6 men, 4 from this parish, were sponsored by St. Mark to come and do crucial renovation work to the structure, which is 110 years old. Thanks to Fr. Pat and Phyllis Provenzano, the volunteers were able to have their accommodations meals paid for by the parish as part of this parish's support of my work. In the local community, the neighboring free clinics, as well as a number of medical professionals have offered their assistance and if the renovations continue at the current pace, we hope to be open by January. Even if we have to delay or alter the nature of the Casa de la Caridad, by simply renovating the facility, we will have already secured a Hispanic Apostolate Center, which will give us the space necessary to run the programs that I began earlier this year. I have to say that I've just tried to stay out of the way - this has really been the work of the Holy Spirit. On so many occasions, I've wondered where I'd get the funding for this renovation or that repair and God has provided. So, I'm here today to ask for your support in prayer and in financial assistance. I will be in the vestibule after Mass today to answer questions and let you see some pictures of what's been accomplished thus far. I'm not asking for money to be sent out of state or even out of diocese - this need is IN OUR DIOCESE. I have to admit that when I began my assignment here in 2002, I never thought I'd be back in 2004 making a financial appeal for my missionary efforts. Like you, I am convinced that EVERYONE COUNTS. For my Hispanics, the Church is their community - it's their family and it's a place where they feel welcomed and safe from a world that is often hostile and foreign to them. Due to their language difference, many feel like 2nd class citizens in our country and many live in precarious family and legal alien status. Like Moses, who appeals to God for mercy, in the 1st Reading, I am here today to appeal to your generosity in supporting work that can make such an important difference in the lives of many of my parishioners and others who live in our parish boundary. Thank your for your prayers and for your financial assistance. May God bless you and your families abundantly in this academic year and as we pray for the souls of those who died three years ago this weekend and their families, we pray that God will continue to bless these United States. Praised be Jesus Christ. Now and forever!